Yes! Another exciting edition of 'The Drop'. Scorcher, Jordan Morris, Jamilah and Noeva all took to the stage at last month's event held at Proud Camden, and did great during their sets. 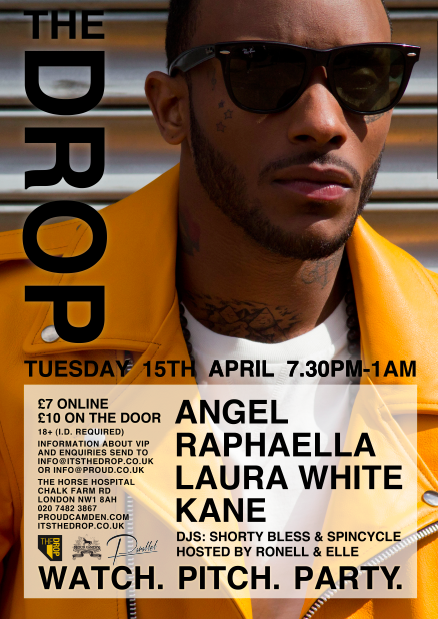 Now the month of April will see a whole new line up including Raphaella, Laura White and Kane, with UK's Prince of R&B - Angel headlining on the night. All the acts will take to the stage to show off their incredible talent, backed by a live band. Party: At the end of the showcase each month, there's nothing left to do but party! The UK’s best DJs make their way to the decks and get the party started. This is a chance for you to get down on the floor, socialise and network with like-minded people. Watch. Pitch and Party with 'The Drop' crew this April!